Could YOU have Vitamin B 12 Deficiency Symptoms and not even be aware of it? While it sounds a little crazy,, there are many research studies estimating that up to 20% of the elderly in the US have undiagnosed vitamin B 12 deficiency! And that is just the elderly population, what about YOU! You don't need to be elderly to be deficient. Vitamin B12 deficiency symptoms are considered fairly rare- and it is this false belief that causes doctors to not even look for vitamin b12 deficiency symptoms- even when they are staring them practically right in the face. Unfortunately, these signs of b12 deficiency are often mistaken for other problems- sometimes even devastating debilitating problems such as Alzheimer’s Disease, Multiple Sclerosis, and Symptoms of Fibromyalgia. Even worse, these problems can occur in the presence of normal or even increased Vitamin B12 Levels due to a genetic defect called the MTHFR Gene that can also lead to Vitamin B6 Toxicity, even when not taking B6 Supplements. problems that it seems half of the population has, most of the time doctors miss the diagnosis of vitamin B12 deficiency because the‘Standard of Care’ is to ONLY do Vitamin B12 Testing if a patient has a condition called Macrocytic Anemia- where red blood cells become large and shows up as a high number on the MCV Blood Test that is part of a Complete Blood Count. But in the vast numbers of cases, Macrocytic Anemia is not present for several years after the onset of deficiency- and that leaves YOU suffering unnecessarily. So, while the classic signs of b12 deficiency and even a high number on the MCV Blood Test and Hyperhomocysteinemia don’t prompt physicians to do further testing for Vitamin B12 Malabsorption, seemingly ‘unusual’ vitamin B 12 deficiency symptoms almost NEVER do. 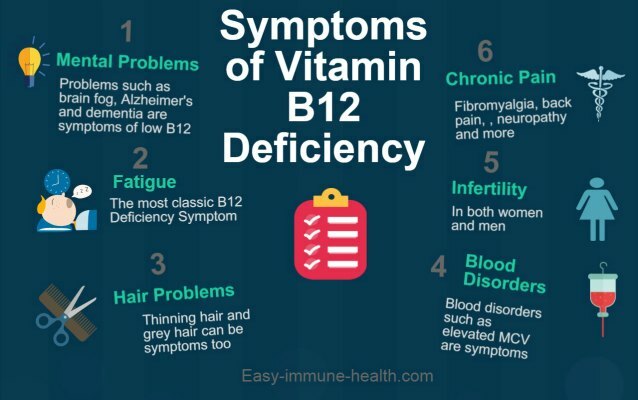 But as we shall see, these symptoms of b12 deficiency are probably MUCH more common than most physicians think and cause devastating problems for those with vitamin B12 deficiency. What makes this even MORE devastating is that these problems could be solved with some inexpensive over the counter Sublingual B12 Vitamins! Sadly, many of these symptoms are even CAUSED by the very doctors who then refuse to look for them. Some mental changes occur due to the use of Dental Nitrous Oxide, a diabetes drug called Metformin, or another drug called Nipride which deplete Vitamin B12 levels and can often cause neurologic deterioration that goes unrecognized by the doctors that CAUSED them! The Facts about Vitamin B12 show that chronic pain conditions can also be vitamin B 12 deficiency symptoms. Particularly back pain, Peripheral Neuropathy and Symptoms of Fibromyalgia. That Vitamin B12 Deficiency is one of the Reasons for Back Pain one of the most exciting, yet entirely overlooked problems associated with vitamin B12 deficiency. Back pain affects almost 1/3 of the entire population. 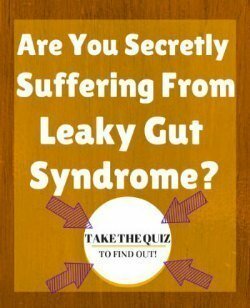 Yet, in some cases it is simply another one of the vitamin B 12 deficiency symptoms. Pain Related to Vitamin D Deficiency can ALSO have these same symptoms and are often related due to the inability to absorb nutrients. 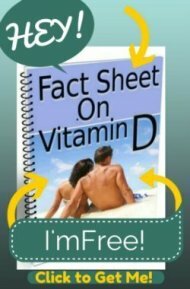 So, if you have Chronic Pain, then get both your Vitamin D Level AND your Vitamin B12 Levels checked! Vitamin B 12 Deficiency Symptoms can also be the Causes of Infertility in Men and women. Just like Gluten Sensitivity and Infertility, doctors rarely look for these easy to remedy nutritional problems that, when remedied, can and do Increase Male Fertility and allow women to get pregnant without having to resort painful and expensive medical procedures such as In Vitro Fertilization. While it seems completely logical and intuitive that malnutrition could be an obvious cause of infertility, in our culture we don't believe that people who look healthy and go on about their day to day lives could possibly be malnourished or have nutritional deficiencies. But even young and seemingly 'healthy' people can have nutritional deficiencies- not only vitamin B12, but other B vitamins and also Vitamin D are MUCH more common than is generally believed, especially when one factors in the high rate of the MTHFR Gene Mutation, which leads to Vitamin B12 deficiency. And deficiency of Vitamin B12 can cause changes in ovulation(6), recurrent fetal losses(7)(8), and even in male infertility as well(9)(10)! While infertility doesn't seem like it would be a 'Symptom' of a vitamin deficiency- it is one seriously underestimated and easy to remedy problem that can help desperate families finally become parents. Blood disorders are some of the most commonly diagnosed vitamin b 12 deficiency symptoms. Conditions like Macrocytic Anemia, even though they can occur up to 2 years after the start of Vitamin B12 deficiency, are what prompt doctors to begin to even LOOK for Vitamin B12 Malabsorption in the first place. So, those vitamin B12 deficiency sufferers ‘lucky’ enough to have unusual looking red blood cells get diagnosed most often. Unfortunately, when you begin Understanding Blood Test Results, you see that a related vitamin- folic acid- often effectively PREVENTSthese blood cells from becoming deformed. The so-called important step of governments mandating the fortification of bread and cereal products has effectively masked the presence of vitamin B12 deficiency in much of the population!! Skin and hair problems and not often thought of to be vitamin problems either, but the often embarrassing skin problem ofhyperpigmentation- when the skin becomes very dark in patches, could very well be one of the Symptoms of Vitamin B 12 deficiency(11)(12). While that is a more unusual skin manifestation of Vitamin B12 deficiency, a much more common skin condition is psoriasis. Psoriasis is a dry and itchy skin condition that is often a problem for years and years, and there are few effective remedies. But vitamin B12 deficiency may be an unappreciated cause of psoriasis(13). Vitamin B12 Deficiency Symptoms are EXTREMELY common and are most often overlooked by traditional doctors. If you have ANY health problems, you owe it to yourself to get tested for the "Master Key" of vitamin B12 and find out FOR SURE if Treatment for Vitamin B12 Deficiency could help you to feel better. Methylcobalamin Vitamin B12 Supplements- Vitamin B12 SHOULD be taken in the form of Methylcobalamin. Don't take anything less! 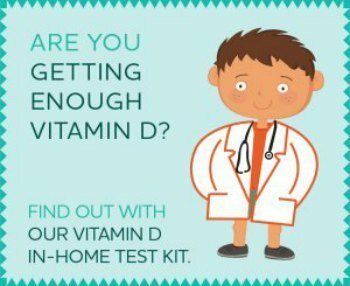 Accurate In-Home Vitamin B12 Testing- This test is NOT ONLY the most sensitive vitamin B12 test available, but it it done Right in Your Home using a single urine sample! This test is a MUST for the elderly, for vegetarians and vegans and for EVERYONE with unresolved health problems that could be Vitamin B 12 Deficiency Symptoms! Elevating Creatinine lvls from B6 toxicity and B12 deficiency or magnesium supplements? I am trying to find a vegan B-12. Most contain dairy. are there any that you know of that are vegan and the type of b-12 you recommend? I am suffering from Hairloss - my b12 results are 411. Please help me on whether you think this would be contributing to hairloss? I have a bad breath from my stomach and I read on some paper and can you believe if I have vitamin B problem can it cause bad breath? Is Memory Loss from Vitamin B12 Deficiency Reversible?